My son is 9 years old. He’s faster than lightning and every since his second birthday, people have been telling us he should play football. I don’t like football, my husband does, but never wanted him to play. We tested the waters with other sports and finally settled on lacrosse. It’s not a “Black sport” but it’s a great one. He loved it. 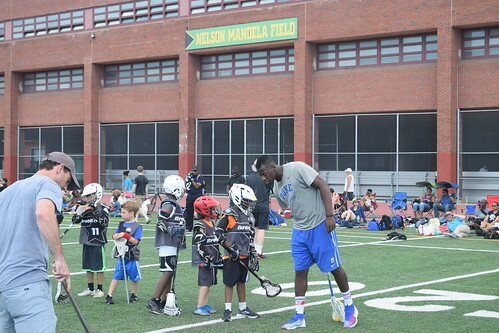 There are tons of Black boys playing football, there are only a few playing lacrosse. And if we’re going to have him play a sport it should be one where he can stand out, right? Our decision wasn’t just based on his ability to stand out, we also live in an area where Lacrosse is THE sport, like football in Texas. If you’re good you can write your ticket to a great college, if you’re great well the world is yours. 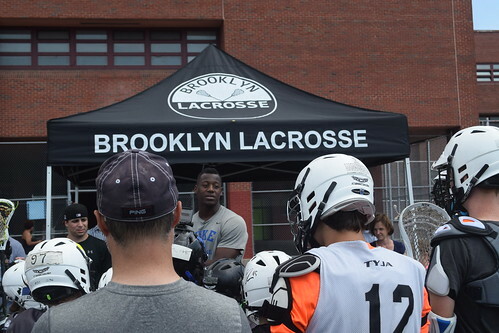 When we decided to go LAX I knew it was important that he wasn’t the only child of color on the team, not at this age, so we signed up for a team in our beloved Brooklyn.A bit more diverse, with a great coaching staff, we knew this was our team. He’s been an active player for two years, and where it seemed like he was going through the motions, he now understands the game and it’s improved his play. YEAH, CJ! This past weekend, CJ had the pleasure of meeting the best lacrosse player since Jim Brown. He didn’t seem as excited as I was but once we made our way to Brooklyn I could see it in his face. He asked me questions like “Mommy, what should I ask him?” “Would it be inappropriate to ask if he liked to read when he was my age?” And on he went. Though he was excited, I don’t know if he understood how important this day was for all the little brown faces that lined up to learn how to perfect their shot. It wasn’t just about meeting a Black lacrosse player, Myles grew up in the same area we live in now, he was more than likely the only brown face on his team at CJ’s age and kids need to see that. I’m super proud of the work CJ did on that field. I’m super proud to be a Brooklyn LAX Mom and I can’t wait for the fall!